These freshly flavoured Green Peas with Mint are a great complement to your traditional Christmas meal. They are super delicious and very quick and easy to make. The kids will love them too! The fresh mint, lemon juice and zest add a lovely freshness to the green peas. The fresh flavour helps to cleanse the palate when eating a heavier Christmas dishes. The peas are cooked al dente, so they still have a bit of a bite to them. The Green Peas with Mint can be served cold or warm. They are delicious either way. You can also easily prepare the peas in advance so you can be completely stress-free during your Christmas dinner. Place frozen peas in small saucepan with the fresh mint leaves placed on top. Add a small amount of boiled water, just enough to cover the peas. Boil for only a few minutes. You still want the peas to have a little bit of bite to them but they should be soft inside. Drain right away. 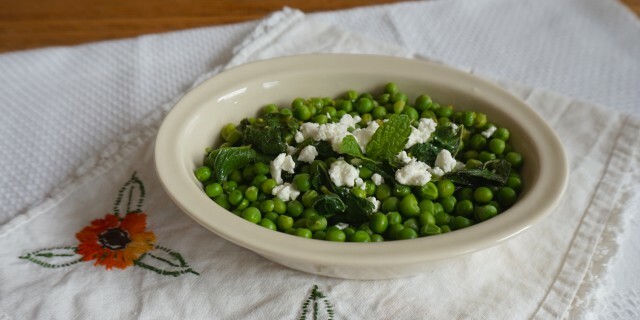 Add the drained peas and mint to a medium-sized bowl. Stir in the extra virgin olive oil and season with salt, pepper, lemon juice and zest. Set aside in the fridge for 30 minutes to ‘marinate’. This dish can be made a day ahead when stored in an air-tight container in the fridge. Serve with fresh goat’s cheese sprinkled on top (optional).